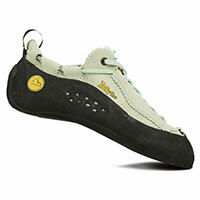 The Mythos is one of those classic rock climbing shoes that will be around forever. It was the first climbing shoe that I bought. Mine was the unisex version, in that shade of purple that looks slightly dated now and brings to mind images of Lycra-clad rockclimbers in the '90s. It's been over 25 years since the Mythos first made an appearance in 1991, and it's still on the market today - still one of the world's most popular rock climbing shoes. That alone should be an indication of how well this shoe performs. 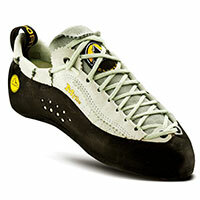 Believe it or not, the Mythos was born as a competition climbing shoe, used by French climber Didier Raboutou. 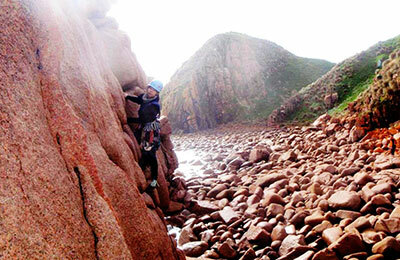 These days, it has a firm foothold in the multipitch climbing shoe genre. And, in this sector, it's really the shoe by which all others should be judged. 3. I wanted a shoe that would suit a beginner, but wouldn't hold me back when I got better. I think all this says a lot about how much I've enjoyed the Mythos. These shoes are next-level sticky. Before I bought my own pair of shoes, I hired a lot of shoes from my local climbing club. Rentals were good enough, but I always found myself slipping off glassy smears at Werribee Gorge and feeling my heart in my throat as I balanced up those smooth "babies' bums" footers at Arapiles. Skating off things always gave me a fright, which really rocked my confidence as a beginner. So it was really important to me to find a shoe I could trust. The women's Mythos has a sole made of Vibram's "XS Grip 2" rubber, which is incredibly sticky and softer than "XS Edge", which is used in the men's version. I've found that the Mythos sticks to even the tiniest nubbins, and even on credit-card edges, I've smeared as much "shoe" as I can get onto these and have been able to stand up. I would hazard a guess that there is no more comfortable shoe on the market. I hear you say, "Doesn't that depend on your foot shape?" Well, normally, yes, it does. But the beauty of the Mythos is that it fits such a large variety of foot shapes: long and skinny, wide and knobbly, fat duck-feet... almost everyone fits into the Mythos. 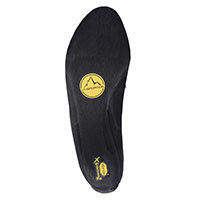 I think that's because of the soft leather La Sportiva uses on the upper. The fact that this shoe is unlined also helps it mould to the shape of your foot. And, the patented lacing system really lets you customise the fit. Because of all these design features, this shoe really becomes an extension of your foot. And that makes it a really comfortable shoe to wear on long multipitches. Interestingly, all these features are also what makes the Mythos perform so well. It's a far cry from an aggressive shoe, but some combination of the sensitivity and the not-snapping-my-toes-in-half phenomenon allows me to use my feet effectively. And, as a result, I climb better. I know. This is a weird annoyance. Also, easily fixed. Still, because I do up my laces fairly firmly, and I have a small foot, there's a whole heap of lace left every time I put the shoe on. There are only so many times I can tie a double-knot. It's not an issue until I stand on a lace and inadvertently untie my own shoe. (Yes, believe it or not, this has actually happened.) If you aren't lazy like me, you could easily either get shorter laces or just shorten them. On steep boulder problems, I don't always feel super secure heel hooking in these shoes. You can actually get around this problem by really cranking in the laces. The Mythos has a patented lacing system that wraps the heel, and so you can actually tighten it for a better fit. That said, the Mythos simply isn't the best shoe for hard-core heel hooking. That's because the Mythos needs a relatively relaxed heel for it to be comfortable. That's part of what makes it a good shoe for smearing. Also, the fact that it doesn't feel like it's chopping your achilles tendon in half (like a more aggressive heel can feel) is one of the reasons it's easy to wear the Mythos for long periods, e.g. on a multipitch. Some climbers have told me that the Mythos stretched two sizes after they'd worn them a while. Personally, I haven't had this issue, but that's not to say that it doesn't happen. It makes sense, given that the leather La Sportiva uses is supple for a snug fit. But, it's something to consider when you're trying on a pair. This is still my go-to shoe when I want a comfortable all-rounder. It is certainly not a grade-12 climbing shoe (if there's such a thing). I've seen someone boulder V7 in Mythos. They can definitely perform. What's more, when I've noticed myself developing bad habits from wearing more aggressive shoes on climbs where they're simply not warranted, I've found that going back to my Mythos really re-calibrates my climbing. They're comfortable enough to encourage me to use my feet properly. In essence, the Mythos is quite a simple design. A flat-ish lace-up shoe. How could it be different to the other flat-ish lace-up climbing shoes out there? For some reason, it is. Perhaps it's something to do with the shape of the last, the fact that they're Italian made and the choice and quality of the materials. When you compare it to sleek, downturned models like the Katana and the Solution, the Mythos may not be the prettiest modern day climbing shoe. But, once you own a pair of Mythos, you'll understand why they've been around for so long. Chelsea Brunckhorst works at Bogong Equipment.